15-year-old Shashank was eager to ride the motorcycle. His father owned a 150cc bike and Shashank requested him for the keys so that he could meet his friends at a nearby playground and learn to ride. He took his father’s motorcycle at night for a month and met his elder friends at the playground where they would show off their motorcycling skills. Young Shashank learned the bike basics quickly and became adventurous. Wheelies, burnouts, etc., the experienced friends taught Shashank how to perform such stunts and the teenager followed their orders. Practicing enhanced his skills and over a period of time, he reached a stage where he performed various stunts easily. One night, his friends recorded a video of him driving the motorcycle and performing stunts on the highway. All this while, Shashank’s parents were unaware of his dangerous night outs. The video was uploaded to Social Media and it went viral. It was covered in the local newspaper and that’s when his parents came to know about his antics. They were not pleased with the young boy’s actions as they cared for him, those stunts were dangerous. He wasn’t wearing a helmet, didn’t have a driving license, and was too young to drive a motorcycle on the highway. The next morning, his parents were in for a shock. The police had tracked Shashank from the video and landed at his place unannounced. Shashank’s parents were imprisoned for a day and a monetary fine was also levied. His mother was a heart patient and the recent events took a toll on her health. His father had to face a lot of humiliation within the society. All this, because they allowed a minor to ride a motorcycle. They violated traffic rules and thus had to face traffic police fines. Shashank finally understood the gravity of the situation and the perils of underage driving. The above example was inspired by a BBC news report. It stated that several parents in the Indian city of Hyderabad were jailed for letting their underage children drive motorcycles. The Motor Vehicles Act, 1988 states that one has to be above 16 years of age to ride a gearless motorcycle (up to 50cc) and above 18 years of age to ride other vehicles (motorcycle with gear and a car). Underage driving is dangerous for the minor as well as the people on the road. Thus, the parents of such wards are penalized with Regional Transport Office (RTO) fines and imprisonment. The parents who were jailed said they were unaware of such traffic rules. One needs a Learner’s License to learn driving and a permanent Driving License once the training is complete. The eligibility criteria for a Learner’s License is as mentioned above. A parent’s signature is needed on the application form if the applicant falls within the 16-18 age bracket. Part E of the license application form deals with this section. Such violations mainly occur due to lack of awareness. Parents need to be more careful while allowing their children to drive a motorized vehicle. Driving without a Learner’s License is a punishable offense as per The Motor Vehicles Act, 1988. 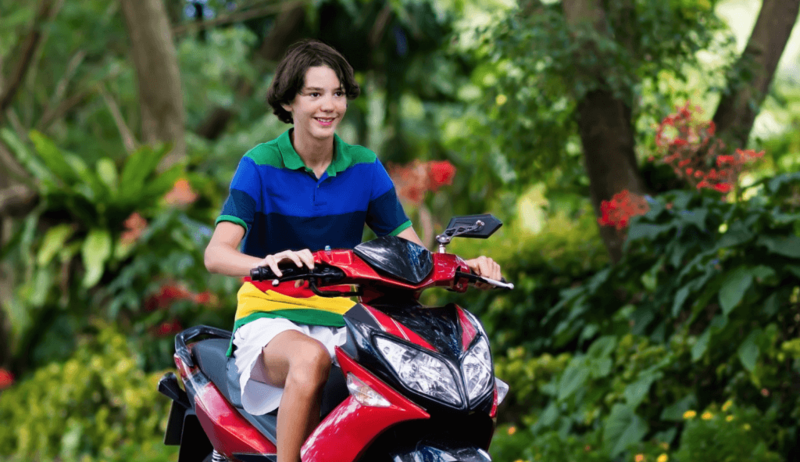 It is understandable that teenagers want to feel the thrill associated with driving a bike or a car, but parents must step in and tell the teenagers to follow the law of the land. In the above BBC news story, if the parents were aware of the law they wouldn’t have allowed the teenagers to drive. Maybe, the punishment sends out a message to other parents to take this issue seriously and not allow their children to ride a bike or drive a car till the time they reach the stipulated age to legally do so. Note that along with a valid Driving License, a driver also needs to possess the vehicle’s insurance papers, Registration Certificate, and Pollution Under Control (PUC) certificate to meet the legal requirements of driving on Indian roads. Read informative Traffic Rules & Violations Articles at Acko. Can Your Car’s Tinted Glass Get You In Trouble? How Does The e-Challan System Work in India?